The US National Oceanic Atmospheric Administration (NOAA) has released an update on the state of the Earth’s coral reefs, and it’s bleak to say the least. For the third year in a row, many reefs around the world will be exposed to hotter-than-normal temperatures, placing them at risk (again) for catastrophic die-offs. This week, scientists are convening at the 13th International Coral Reef Symposium in Honolulu to discuss the latest research on our planet’s increasingly desperate-looking coral reefs. The first order of business was a grim one: to deliver the news that the current global coral bleaching event, which has caused more than 90 per cent of the northern Great Barrier Reef to starve, is not going to end anytime soon. It’ll continue through the end of this year, if not longer. When ocean waters get too warm, corals become stressed and expel the symbiotic algae that provide them with food. 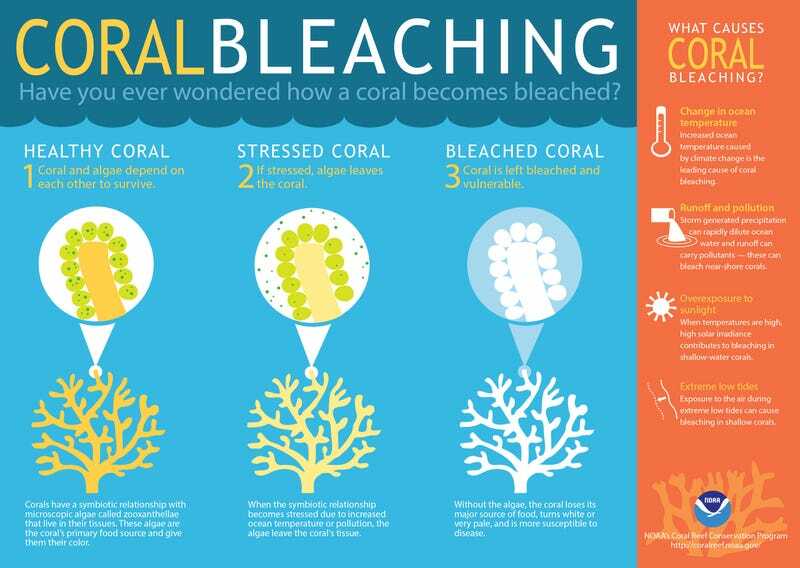 This process, called bleaching, causes the coral to turn a ghostly white. If the water remains too hot for too long, the algae will not return and the coral will starve. Coral bleaching has probably been around for as long as modern corals have, but global bleaching events are a decidedly recent phenomenon. The first global bleaching event, in 1998, killed 16 per cent of the world’s reefs in a matter of months. Another mass bleaching, in 2010, led to widespread reef devastation throughout the Caribbean. The third global bleaching event, which began in 2014, has seen more than 40 per cent of our planet’s reefs exposed to stressful temperatures. It’s too early to say what the total mortality will be, but all signs are pointing to a coral die-off of unprecedented proportions. In the last few months alone, some 22 per cent of the Great Barrier Reef has been declared dead. All three mass bleaching events on NOAA’s books have coincided with strong El Niño conditions. But nobody who studies coral reefs believes El Niño is entirely to blame. After all, the El Niño Southern Oscillation climate pattern has been around for thousands of years or longer. The new ingredient today is human-caused climate change. As ocean temperatures rise — and they already have, by approximately one degree Celsius — global bleaching events like the one we’re currently embroiled in are expected to become more widespread, frequent, and severe. This is eroding the natural resilience of reefs, which is why the sight of vast, coral graveyards and the smell of millions of rotting animals have become eerily common. A study published in April in Science found that if global carbon emissions continue to grow unchecked, coral cover in the Great Barrier Reef will crash by mid-century. The silver lining to this thundercloud of doom and gloom is that it’s clear that humans can help reefs survive. Just last week, an analysis of over 2,500 reefs around the world identified 15 “bright spots”, or ecosystems that stood out as doing better than they should be. The common thread among them? People. Most of the reefs doing well were in fished or populated areas, where local communities are actively engaged in reef management. Some researchers are even starting to engage in widespread coral collection efforts, so that the genetic diversity of reefs can be preserved and mined for potentially adaptive traits. But in the long run, all of these measures are stopgaps until we address climate change. Most marine biologists agree that two degrees of global warming — the target recently put forth in the Paris Climate Agreement — isn’t going to cut it. We need to limit warming to less than 1.5 degrees to give our reefs a fighting chance. As Eakin put it, “the difference between 1.5 and two degrees for coral reefs is huge”.